Today’s poem, written this morning, was inspired by the eponymous sculpture by Henry Moore, contemplated during a visit to Tate Britain in Pimlico last Sunday. 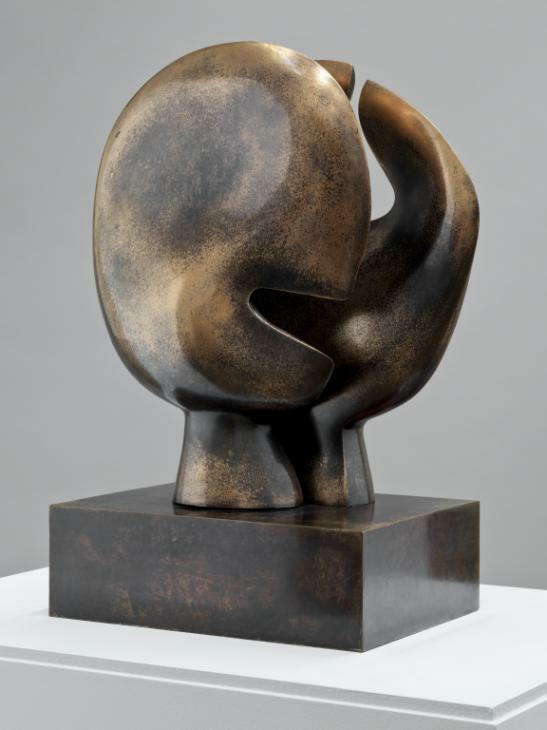 This relatively small piece, dating from 1964 and cast in bronze, is one of Moore’s most intimate and expressive sculptures. Its eloquent, wordless beauty, like that of any true classic, is inexhaustible. If you haven’t seen it already, there’s still time to catch the free exhibition of sculptures by Alice Anderson at the Wellcome Collection in Euston Road, (diagonally opposite Euston Station), before it closes on 18 October. 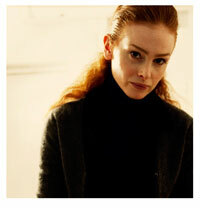 Alice Anderson asks you to take a journey into memory. Displayed together for the first time is a series of sculptures which prompt you to rediscover things you thought you already knew. A computer, a record-player, sketch-books, a bicycle, even a staircase have been transformed into luminous half-recognisable shapes through a process the artist refers to as “mummification”. This process actually involves the objects being bound with very fine copper thread so that they are, theoretically preserved for all time. The exhibition experience is broken down into a series of themed rooms. In the first room, called Studio, you are invited to contribute to a sculpture by becoming part of Anderson’s studio. 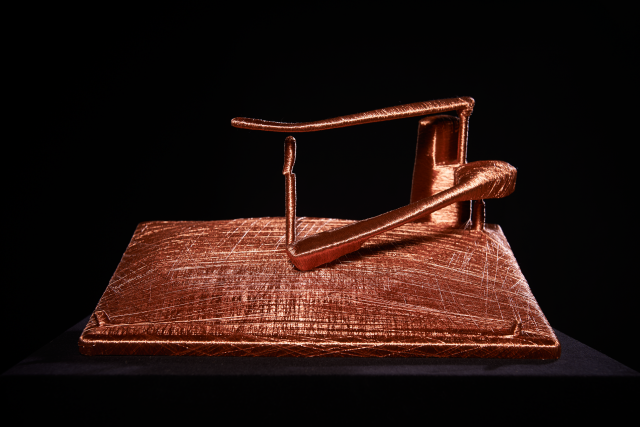 Here you can participate in the transformation of a ‘naked’ object by weaving copper thread around a 1967 Ford Mustang. 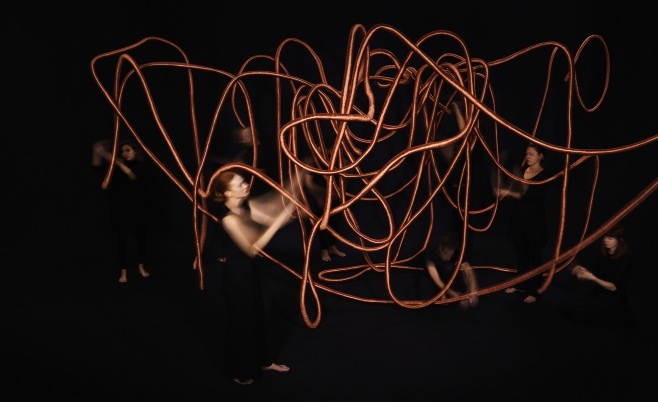 The space where this occurs has minimal lighting to heighten the impact of the glowing copper thread and the effect is absolutely breathtaking. And as you move through the different spaces of the exhibition you are bombarded with a series of everyday objects similarly wrapped in the copper thread. The range of objects mummified includes a plasma tv screen, a guitar, a bicycle, keys, a telescope, a turntable, eye glasses, a smoking pipe, a telephone, coat hangers, a stethoscope, tools including screwdrivers and hammers, a basketball, a boomerang, a set of drums, ladders, shelves, geometrical shapes, and so on, and the cumulative effect is spectacular. Two sculptures in particular caught my imagination: the first was a staircase wrapped in the luminous thread, and such was the scintillating play of light that it appeared to be a staircase to heaven. The second sculpture (illustrated at the top of the page) was a huge, twisting and turning cable of copper rope suspended from the ceiling in one room creating a beautiful abstract space that visitors are able to walk through and therefore observe the rope from every dimension. Like with so much conceptual art, Alice Anderson is inviting us to take a fresh look at everyday objects we take for granted by reducing them to their essential shapes. However, the fact that they are bound in a glowing precious metal inevitably enhances their worth—especially given the market price of copper today—and the overall effect is as though Miss Anderson has transformed the objects into gold with her Midas touch. I would add incidentally, that it is probably no coincidence that the artist’s own hair is copper-coloured. Make of that what you will! Never been to the Wellcome Collection? If that’s the case, make a note. It’s a fabulous exhibition space, and the museum’s permanent collection is full of informative displays. The building itself is worth a drop-in visit, and on the day I was there the cafeteria and bookshop were buzzing. On top of all this, the venue has a broad programme of events embracing the arts and sciences, the majority of which are free. Details available from http://wellcomecollection.org/.